The young Bidens stem illustrated to the right, typifies many plants which exhibit limited secondary growth. 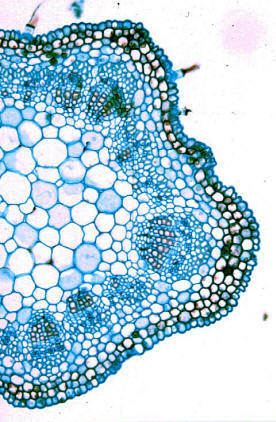 Secondary growth is limited in this and other similar species, to the primary vascular bundles and to some extent, some secondary growth will occur in the interfascicular region between vascular bundles, where limited activity by the interfascicular cambium will produce some secondary phloem and secondary xylem. The stem will undergo very few additional changes - no periderm will be formed, but additional lignification of fibers in the outer regions of the cortex will occur, as will some lignification of pith parenchyma. Question: What advantages do you think that limited secondary growth will present? Think also on potential savings in carbon-based materials - how will these be applied in this plant?